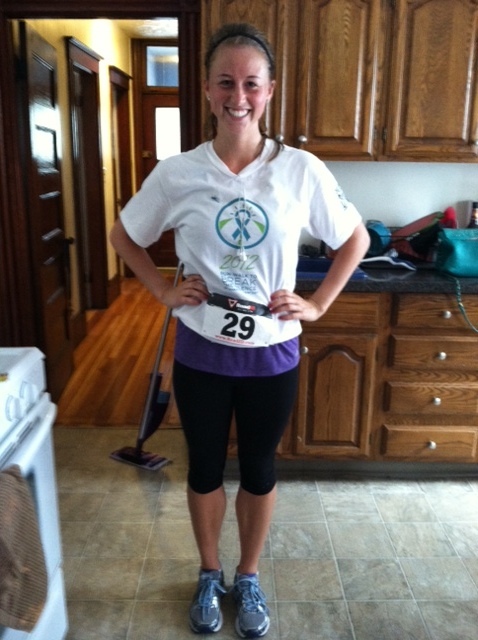 Fit for Success: First Race of the Season: Ovarian Cancer 5k! First Race of the Season: Ovarian Cancer 5k! Entering races motivates me to train (even on days I'd rather lay on the couch and watch Project Runway) but it also is a great way to give to charity and promote a cause. It was a nice, cool Sunday morning, and I was SO amazed at how many people turned out to run! I love seeing people being active while contributing to such a great cause! Of course, I woke up completely exhausted this morning.. but that didn't stop me! I began my run nice and slow (typically everyone SPRINTS as soon as the gun goes off....) and in about 4 minutes, I was passing most of those silly sprinters as they had to stop to catch their breath. Definitely motivation to keep running! 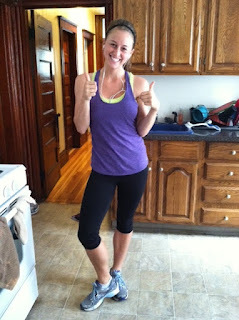 Here I am before the run! Ready to go! My goal was to run the race in 27 minutes without stopping. I haven't timed myself all summer, so I figured 9 minute miles would be a good goal! To my surprise, I was able to run the 5k in 25:10 and it felt great! Can't wait to try to beat my time in the next race! GOAL-SETTING is so crucial because it gives you something to push yourself towards... and makes you feel incredible when you accomplish your goal! 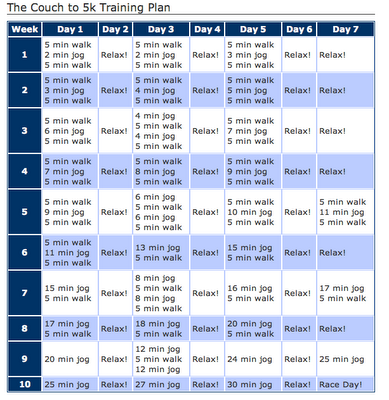 Honestly, I had no organization as to why I ran those distances, I just based it off of my energy level each day, but if you are looking for ways to get into running shape, there are SEVERAL websites that set up daily plans to help you be race-ready. One is "Couch to 5k" (listed below) and you can also get it as an app on your phone! I always recommend that you set a goal, start slowly, and with each run, try to go a couple steps further. Before you know it, you will be running double what you used to! 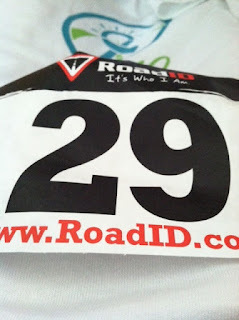 So there is the summary of how my first race of the "season" went! I have a few more on the calendar and can't wait to run them!